MISAWA AIR BASE, Japan (Sept. 22, 2000) -- Despite the gray overcast skies and a few sprinkles of rain, more that 120,000 visitors made a pilgrimage to the Misawa the Air Base flight line Sunday. The throng of visitors came to see exactly what the United States Air Force, the Japan Air Self Defense Force and the United States Navy do here each day. The crowds appeared outside the main gate well before they were opened to the general public, at 7 a.m. They came from as far as Tokyo to see the teamwork demonstrated by the joint and bi-lateral services assigned at Misawa Air Base. The Japan Ground Self Defense Force displayed much of its military hardware, including a surface to air missile launcher, a bazooka, and a several pieces of fire fighting equipment during the 2000 Misawa Air Festival. Visitors were allowed to handle or walk through various pieces of JGSDF military hardware. 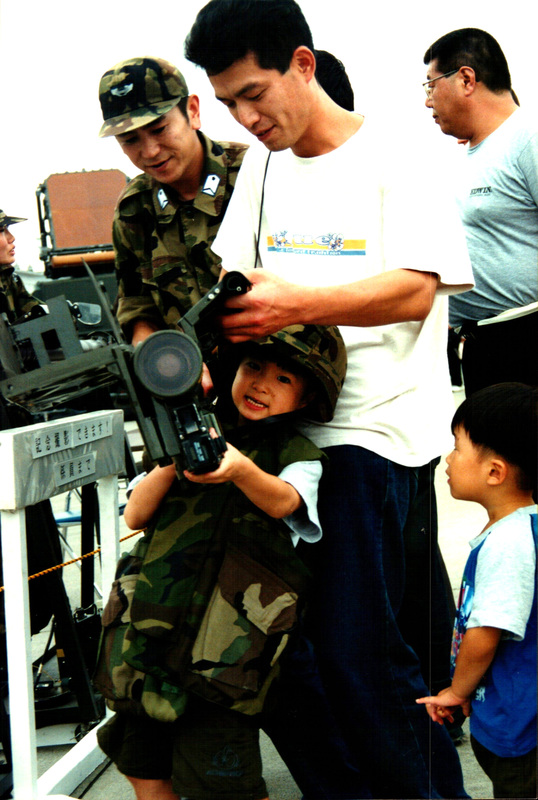 This young Japanese boy, aided by his father, handles a JGSDF bazooka. A JGSDF ground troop assists. "These people came not only to see the aircraft, but to see, perhaps, the only examples of Americana they have ever seen," said Maj. Claudia M. Foss, 35th Fighter Wing chief of public affairs. "Some of these people have never met an American before, and they were interested in everything they could see, the clothes we wear, the music we listen to, the aircraft our military flies and the food we eat." Air Festival visitors seemed particularly interested in American style food, as evidenced by both the large number of pizza boxes carried around the flight line as early as 8:15 a.m., and the line at the pizza booth that stretched half a city block nearly the entire length of the festival. The festival was marked by appearances from several military aircraft and demo teams. The lineup included a demonstration by the Pacific Air Force's F-16 demonstration team, several fly-bys from JASDF's powerful F-4 aircraft, and a demo by the Navy's agile F/A-18 fighters. Aircraft were not the only things available to entertain crowds. In addition to flying military equipment, the Japan Ground Self Defense Force displayed much of its military hardware, including a surface to air missile launcher, a bazooka, and a several pieces of fire fighting equipment. While powerful military equipment was available to entertain base visitors, there were also appearances by the Japan Air Self Defense Force's Northern Air Defense Force Band and the United States Air Force's Strolling Strings. Planning for the 2001 Air Festival is already underway.